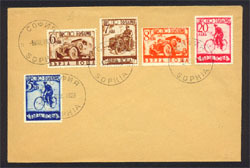 3510 L BULGARIA (1939) Bicycle*. Motorcycle*. Mail car*. Scott No E1-5, Yvert No E16-20 on unaddressed cover.